Tween Tuesday is a weekly meme hosted here at GreenBeanTeenQueen to highlight great reads for tweens. Join the fun and add your Tween Tuesday post below. About the Book: Dini's parents have just announced that they're moving to India for two whole years! Dini can't believe her parents are making her move away from her best friend Maddie and now she has to miss out on the Bollywood dance class she and Maddie were going to take. But India is home to Dini and Maddie's favorite movies and their favorite Bollywood star, Dolly Singh. Dini's parents aren't moving to Bombay, the movie capital of India, but instead to a small town called Swapnagiri. Surprises are ahead for Dini as she discovers that her favorite star might be closer than she thinks-and Dini has a plan to meet her idol. 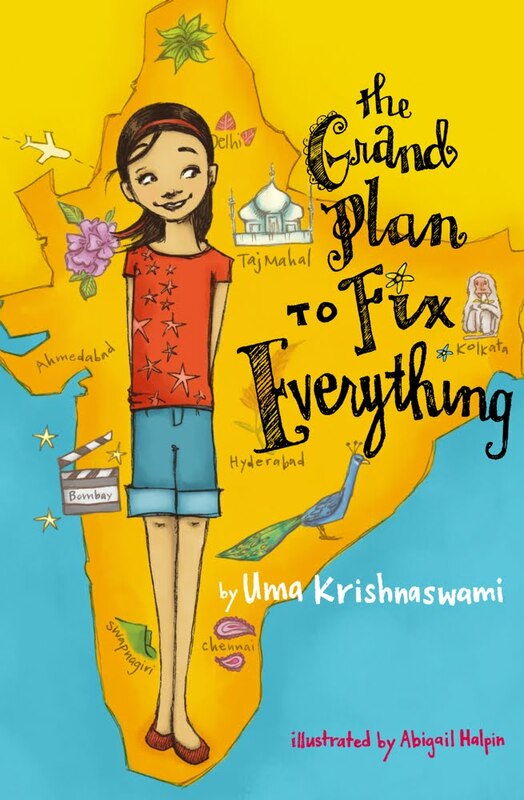 GreenBeanTeenQueen Says: Our summer reading theme this year for the kids program is One World, Many Stories, and I can't wait to highlight The Grand Plan to Fix Everything as a great read for our theme! Ms. Kishnaswami transports readers to Swapnagiri and throws us right into a storyline that is a wonderful nod to Dini's favorite Bollywood films. I did think at times Dini seemed a bit younger than an eleven-year-old and at the beginning the narration seemed a bit simplistic. But it picked up and got better as the story went on, so maybe I was just being a bit picky at first. The story is mainly about Dini, but there are many supporting characters that appear and we learn about their stories as well. It's a somewhat silly story and you have to suspend some belief, but that's the charm of the book. The book really does read like a script for a Bollywood film complete with some zany and charming characters, a romance, random happenstance and coincidence-I even expected the characters to break out into song! Dini might be eleven, but I would hand this one over to early tween readers looking for a funny, light story that will take them to a new part of the world. The book has fantastic illustrations that accompany the story and the book is fast paced-I read it in one sitting. There's plenty of humor and madcap fun to keep readers engaged. Book Pairings: Dini reminded me a lot of Allie Finkle, so I think fans of Meg Cabot's tween series would enjoy this book. I'd also pair with the Popularity Papers: Book Two by Amy Ignatow, which also features best friends separated by a move to a new country. I love Allie Finkle! I am going to have to check this one out. This looks so cute! Also, anything like Allie Finkle must be awesome! Looks like an adorable book! Have to get it for my daughter.